(AINA) -- The seventieth annual convention of the Assyrian American National Federation (AANF) was held in Chicago from August 28-September 1. 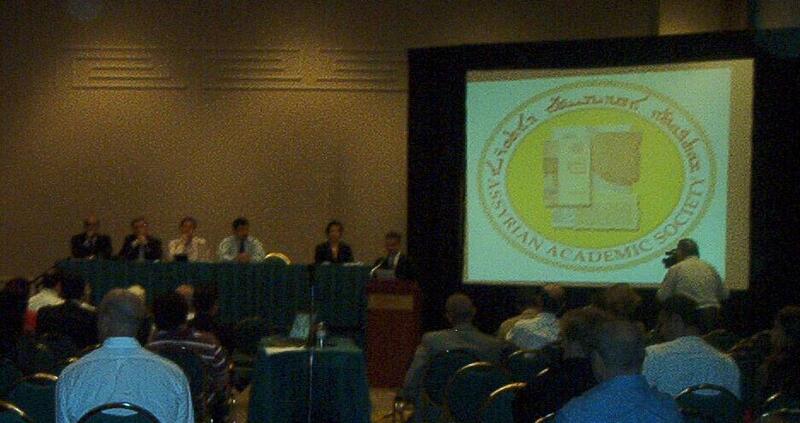 In addition to the extensive cultural, arts, and social events, the AANF again hosted several political and historical panel discussions of interest to Assyrians (also known as Chaldeans and Syriacs) attending the convention from North America, Canada, Europe, Australia and the Middle East. The panel discussion entitled Focus on Iraq on August 30 featured an impressive array of speakers including Mr. Firas Jatou of the Assyrian International News Agency (AINA), Dr. Ronald Michael of the Assyrian American League (AAL), Fr. Ken Joseph an Assyrian activist now based in Iraq, Mr. Willy Fautre from Human Rights Without Frontiers, and Professor Walid Phares of Florida Atlantic University. The panel was moderated by chicago-based attorney Genevieve Daniels of the Assyrian Academic Society. The panel discussion centered on the future political aims of Assyrians in Iraq. Mr. Firas Jatou of AINA presented an historical analysis of the demographic concentrations of Assyrians in the northern Iraqi provinces. Drawing on maps of Assyrian villages and historical sites from the 1960's, Mr. Jatou demonstrated that the greatest concentration of Assyrian villages remained relatively intact around the province of Mosul (ancient Nineveh) and Dohuk (Noohadra) despite centuries of persecution and upheaval. Mr. Jatou also showed that, despite the destruction of nearly 200 villages by the Iraqi government and Kurds from the 1960's till today, Assyrian villages remain prominent in Nineveh and Dohuk. Dr. Ronald Michael of the AAL outlined the past year's lobbying efforts in Washington and plotted a course for future activities. Rev. Ken Joseph, having just flown in from Baghdad to participate in the panel discussion, described the difficulties in the daily life of Assyrians as well as the political challenges in Iraq. Rev. Joseph implored Assyrians in the Diaspora to remain committed to the Assyrians of Iraq by visiting and assisting. Rev. Joseph predicted that without an Assyrian autonomous area, the threat of Islamic pressures would drive Assyrians out of Iraq. Mr. Willy Fautre presented the most detailed proposal for autonomous regions within an integrated Iraq based in part on a Belgian model that respected ethnic and linguistic minorities' rights. In Mr. Fautre's model, two overlapping forms of federalism are envisioned. First, the nation would have separate administrative "regions" each with its own parliament -- a form of territorial federalism. Each community e.g. Assyrians, Turkman, Arabs, and Kurds would also have their own parliament representing their communities throughout the country -- a form of community federalism. The community parliament would have full autonomy in schools, culture, agriculture, energy, religion, protection of monuments etc. The unity of the federal government would be guaranteed by a bicameral system with a House of Representatives elected directly by the people and a Senate appointed by the various communities. For legislation affecting linguistic, cultural, or religious rights, both houses of parliament would have to pass the bill. In addition, though, in the community-based Senate, a super-majority (e.g. 2/3) vote would be needed in addition to a simple majority of every represented community. In such a way, each community would enjoy virtual veto power in matters of language, culture, and religion. Prof. Walid Phares of the World Lebanese Cultural Union (WLCU), began his presentation by asking why he as a Lebanese Maronite ought to be speaking on the political future of Assyrians in Iraq. "Simply," he answered, "because we are one people. We believe we are the Western Assyrians and you are the Eastern Assyrians." Mr. Phares added his historical perspective on federalism noting that during the Lebanese conflict the Syriac Maronites proposed a similar federalism as a solution to the Lebanese conflict, but the proposal was rejected and never implemented. Mr. Phares noted that after September 11 and the subsequent War on Terror, world opinion had shifted and that now was the time to press for federalism entailing an Assyrian province in Iraq. Mr. Phares added that Assyrian rights were in essence the test case for ethnic minority rights for all religious and ethnic minorities throughout the region including the Assyrian communities in Syria, Lebanon, Turkey, and Iran as well as other religio-ethnic Christian communities in Egypt and Sudan. Mr. Phares advocated developing a regional strategy to "connect the dots" of the various till now disparate efforts especially between the Syriac Maronites and Assyrians. The proposal for an Assyrian self administered zone established in the environs of Mosul, extending to Dohuk in the north and Fesh Khabur to the northwest has gained increasing appeal among Assyrian activists, intellectuals, and political leaders. The current political challenges facing Assyrians in the newly developing Iraq include rising Islamic pressure, gross under representation of Assyrians, and a sometimes callous misrepresentation of Assyrians simply as a Christian minority without reference to the Assyrian political, cultural, and nationalist platform. As Mr. Jatou reflected, the increasing Islamic fervor as well as other challenges in Iraq necessitate the establishment of an administrative area for Assyrians and Yezidis, who are, along with the Mandeans of southern Iraq, the indigenous non Muslims of Iraq. Such an area would serve as a sanctuary to preserve and protect Assyrian language, culture, religion, and geography-- in short, ensure Assyrian survival. Reflecting on the tone and direction of the AANF convention panel discussions, one observer approvingly noted a heavy emphasis on the current challenges of Assyrians in Iraq and the Middle East. "Seventy years ago," he stated "the AANF was founded by Assyrian Americans specifically in response to the massacre of Assyrians in Simele, northern Iraq by the newly formed Iraqi Army. The massacre of thousands of Assyrian women, children, and elderly was the first military campaign of the newly formed Iraqi State. Seventy years later our people are once again at the threshold of a newly emerging Iraqi nation. We need to make sure we Assyrians in the Diaspora along with all of our organizations remain focused and once again continue the commitment and guardianship over our people in Iraq."